Home / What is Orphan Hosting? MLJ Adoptions is not currently facilitating an Orphan Hosting Program, but we are happy to provide information about the possibility of assisting your family with an adoption after you have participated in an Orphan Hosting Program. Hosting is life-changing event for both the host child and the host families. We are seeking families who are willing to invite a child from Ukraine into their home as part of your family for a portion of the holidays this year. Being included as a member of a family and receiving unconditional love gives an orphan hope for a better future. Who is eligible to host? Families wanting to host a child from Ukraine should have extra love to share and a home ready to open up a child. Patience and ability to communicate through a language barrier is a plus! Additionally, there can be no more than 45 years age difference between the host parent and host child for at least one spouse. Families must live within driving distance of the Indianapolis Metropolitan area to become a host family. Do I have to have a home study? Families do not have a formal home study completed, but they will need to have a Host Safety Review. The purpose of the Host Safety Review is to identify all members of the household, complete security checks, inspect the home and the child’s bedroom, assess the community/neighborhood environment, discuss the hosting process and commitment with the entire family, collect medical information on the family, and discuss the activities that are planned for the child during the hosting period. If the home has pets or water hazards, these will also be addressed. MLJ Adoptions will assist in coordinating the Home Safety Review. If the host family resides outside of Indiana, additional requirements may exist. Prior to the Host Safety Review, families must complete all required background checks. Do we have to adopt in order to host? The Ukraine Hosting Program is a unique and wonderful opportunity. It will allow your family to try out what it may be like to have an additional child in your home. However the primary goal of the hosting program is not adoption. The most rewarding part of hosting is being able to see firsthand the child’s personality bloom as they experience what it is like to be part of a two-parent family and experience family activities, possibly for the first time. Many of the orphanage directors that have participated in hosting programs share how this opportunity helps to build the children’s confidence and promote improvement in the children’s behavior. Once these same kids are shown individual love and attention, it changes them forever. It gives them hope knowing there is someone out there that cares about them. Your family may complete the hosting process and desire to adopt. If so, MLJ Adoptions is happy to communicate what your options may be, either adopting from Ukraine, or perhaps a different country program. Your family may also decide that adoption is not for you, but that you have a burden to advocate on behalf of children in need of families worldwide. If that is the case, we want to continue to foster your commitment to the orphan and will provide you with avenues to do so. We are here to help you process through how this experience changed your family. What if both of the host parents work during the day? Unfortunately, host children are not permitted to be put in a daycare or a daycare setting. There may be options available if both parents work outside the home, but coordinating child care is the host family’s responsibility. What is the best way to handle the language barrier? Surprisingly, communication during a hosting experience is usually not a problem. If the host family does not feel comfortable trying to communicate with a child who only speaks Russian, your hosting agency may provide resources so that families have access to translators who travel with the children and to help families communicate with the child throughout the program. Translators can be accessed by telephone or the host family has the option of hosting a translator in their home for the duration of the program. How do I know if adoption is an option? If the host family decides to pursue an adoption in Ukraine, the family may request to adopt the child they hosted. MLJ Adoptions will work with families that express a desire to adopt their host child, but any referral issued comes from the Ukrainian State Department of Adoptions and cannot be assured by MLJ Adoptions. In the past, not all families have been able to adopt their host child, but have considered their experience as a stepping stone to moving forward to adopt an older child from Ukraine or another country. Can we travel during hosting? There are group activities and translators to help with communication. When families don’t have access to the translator support, stress levels can go up for the child and an otherwise pleasant hosting experience can turn sour. This kind of request from a family requires individual assessment and permission from the guardian who travels with the children. Unfortunately, a visiting child’s adaptability and ease with all the transitions here can’t be evaluated until they arrive and are observed for a few days. Some children more easily adapt to changes and the language obstacle. Therefore travel during the hosting program would need to be evaluated by the hosting agency on a case-by-case basis once the child arrives. Why do the children have to go back to Ukraine? The children visit the U.S. on a visitor’s visa that expires in 30 days. Both the Ukrainian government and the U.S. government expect the children and adult visitors to return according to international guidelines. The visitor’s visa provides the opportunity for the children to visit interested families. A permanent stay with a family requires much more extensive paperwork to be completed and a formal adoption proceeding in Ukraine. What do they eat? Kids will be kids! Some children are pickier than others, and you have no way of knowing this going into the hosting process. Popular Ukrainian foods include potatoes, cabbage, and soup. Most Ukrainian children enjoy American food, but it’s important to be aware that American food may make the child’s stomach upset or the child may not like the food. Be prepared and do not be offended. Can we stay in touch with our child after hosting? It may be possible to stay in touch with a hosted child once he or she returns to Ukraine. However, this depends on the orphanage or foster home where the child lives. I am ready! What do I need to do to sign up to be a host family? 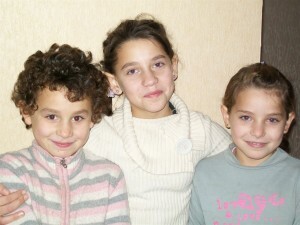 MLJ Adoptions works closely with Host Ukraine Orphan Initiative. Find out more by contacting info@hostukraine.org.